What Does Tafoni Mean? Where Did the Name Come From? The geological term tafoni are to a unique class of cavernous weathering structures made by differential and salt weathering processes. Tafoni is the plural noun and adjective; tafone is the singular noun for a single cavern. Occasionally, researchers unnecessarily pluralize tafoni (i.e., tafonis) to name multiple tafoni. Charles Darwin (1839) may have first described tafoni while on the Beagle when passing through King George’s Sound in Western Australia. Though he thought the forms he discovered along the coastline were a product of calcareous casts of branches of trees or roots (Mustoe, 1982; Turkington and Paradise, 2004), scientists now know the eolianite he observed in Western Australia is a weathering product. •Sidewall tafoni. Tafoni on the steep sides of cliff faces, boulders, or outcrops are called side, sidewall, side-tafoni, or lateral tafoni (Seitentafoni in German). Individual sidewall tafoni forms in Hong Kong have been described as “circular, pear-shaped, crescent-shaped, like long furrows, like flower petals, or in other irregular forms” (Tschang, 1974). •Basal tafoni. Tafoni that form at the base of outcrops and boulders and on the undersides of outcrops and exfoliation sheets are called basal tafoni (Basistafoni in German). •Nested tafoni. Cavities that occur inside one another in a fractal-like manner are called nested or subordinate tafoni (Nebentafoni in German). •Honeycomb. The French equivalent for honeycomb, a cell-like variant, is maladie alveolaire. In Livorno, Italy, locals know cell-like tafoni as sassoscritto, or stone writing (McBride and Picard, 2004). 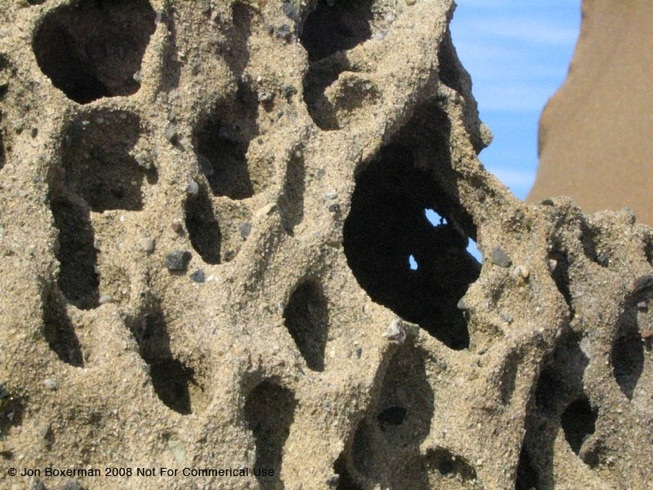 Tafoni are referred to as nischen meaning niches in German. •Iconic tafoni. In Hong Kong, iconic terms have been used to describe “ruined tafoni” like death’s head, dog head, eagle head, elephant head, and sea lion (Tschang, 1974). Tafoni smaller than a football are sometimes distinguished as miniature tafoni (Tschang, 1974). At Salt Point State Park along the Sonoma Coast in Northern California, locals call tafoni “Weird Rocks”. •Relic tafoni. A tafone no longer actively enlarging is a relic tafoni, evidenced by a cavity backwall enveloped by lichen or other biological coatings inhibiting differential weathering.